WEST SPRINGFIELD –Here comes the largest bridal expo in Western Massachusetts: It will take place on the Eastern States Exposition grounds Jan. 23-24 featuring gowns, formalwear, prizes, fashion shows, music and entertainment, photographers, videographers, limousine services, floral designs and food samples. The 26th annual Springfield Bridal Expo is produced by Jenks Productions Inc. at the Better Living Center; it will highlight more than 150 companies offering a wide variety of styles and prices. + A cake gift certificate courtesy of Moore Cakes. Mark H. Giza of Mark Henry Florist in Indian Orchard will have a booth at the expo. 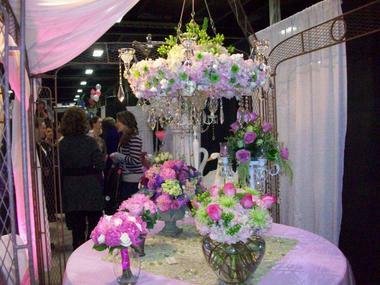 “It’s good to show new bouquets, designs and trends,” he said of the show. “Frills have kind of gone by the wayside,” he said of bouquets. Instead, the trend is for “very high style, simple, elegant-looking” featuring flowers like peonies, calla lilies and garden roses. The expo is a great marketing tool for vendors, Jenks said, as it offers them a way to meet their customer base. When: Jan. 23-24, 11 a.m. to 5 p.m. The expo is a more traditional way to see what vendors have to offer, an opportunity to talk with them rather than to see on line what they can provide for a wedding. “It’s a lot of fun, and everyone is in great spirits,” Jenks said. Whether couples only need to find a photographer or need to plan their entire wedding, they can do it all at the show. Show hours are Saturday and Sunday 11 a.m. to 5 p.m. Admission is $10. Go to www.jenksproductions.com for more information and to print a $1-off admission coupon when you register there.